Cambodia, Malaysia, Laos, Thailand, Vietnam, Singapore, Indonesia. It inhabits lowland rivers and flooded fields. A dark substrate will help to make this shy species less nervous, and it will also display it’s best colours. Provide cover by planting some areas of the tank densely, along with some floating vegetation. Rocks and driftwood can also be used. It is a freshwater species and does not require the addition of salt to it’s tank. Relatively unfussy, and will accept most live, frozen and dried foods. P. siamensis is peaceful and shy, and should not be combined with vigorous or aggressive species. Good tankmates include barbs, livebearers, smaller rainbowfish and loaches. It is a shoaling species and will not do well if kept singly or in pairs. Aim for a group of at least 6. 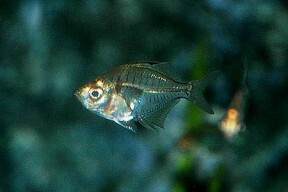 Males do become somewhat territorial when spawning but physical damage is rare. Unknown. Adult females will most likely be fuller in the belly when inbreeding condition. Not thought to have been bred in captivity, although the process is probably similar to that of P. ranga. This occasional import is sometimes offered for sale as P. ranga, the Indian glass fish. 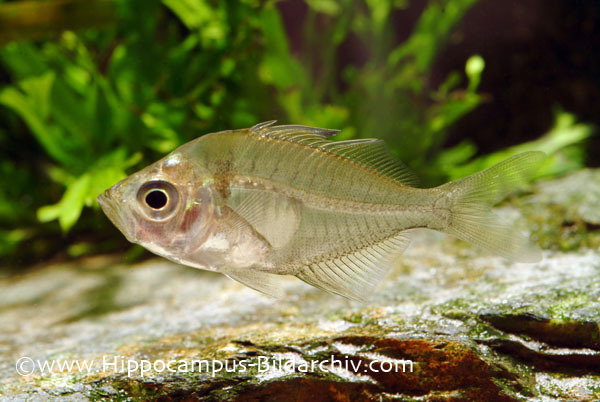 Unlike that species however, P. siamensis is an exclusively freshwater fish and should never be kept under brackish conditions. It can be distinguished from ranga by the lack of patterning behind the eye and it’s generally more elongate body.